It's not the most charming Short Scale we've played - that honour goes to the Tele - but it still brings new tones and brilliant value for money to the party. Offers a darker variation on Strat tone that still retains essential Strat DNA. Represents excellent value for money. Controls feel a little crowded. The guitar giant announced this Modern Player Short Scale Stratocaster earlier this year, but short scale Fenders are nothing new - just ask the users of shortscale.org, a whole wiki devoted to their charms. Indeed, the Mustang, Jaguar, Duo-Sonic, Musicmaster, and even the Bronco, have been used to create their fair share of great music over the years. Yet here at the tail end of 2014, with miniaturisation abundant in the workshops of amplifier and effects pedal engineers the world over, we find The Big F taking a pillar of the electric guitar church and downsizing it. "The guitar appears to be exceedingly well-made for the money"
From more than six feet up in the air, it's difficult for this writer's brain to relate to a scenario in which a regular Stratocaster seems just too large and unwieldy. Yet for a player for whom the standard Gibson scale length of 624mm (24.6") is 'home', Fender's 648mm (25.5") can feel, initially at least, quite different - not least the added string tension. So, the extra elasticity of a shorter scale length combined with traditional Fender appointments has its appeal. That said, a cursory glance at this Chinese-made Modern Player reveals much that's not so traditional. 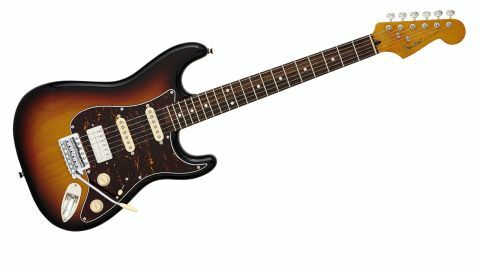 Predictably, perhaps - given its control setup - the Short Scale Stratocaster looks a little crammed and packs an awful lot of functionality into a small space, even with a single master tone control governing all pickups rather than the usual pair. Another obvious departures from Leo's blueprint comes in the shape of the Guild humbucker that is present at the Strat's bridge. The Stratocaster is loaded with an 'Anti-Hum' Dual-Coil, as featured on the Guild Starfire reissues we were much enamoured with recently, while the Telecaster's PAF-sized HB-1 'bucker comes straight off the Guild S-100 Polara. Though Fender's decision to incorporate pickups branded with a marque that it has recently sold may seem a trifle odd, it wouldn't be the first time that the contents of a major manufacturer's parts bin have spawned a new model. Gibson's Les Paul Deluxe, for instance, arrived in 1968 as a means to utilise leftover Epiphone mini-humbuckers when the company moved Epi production to Japan. "Plugged in, there's overall tonality that's on the darker end of the Strat spectrum"
The guitar appears to be exceedingly well-made for the money, with neat and tidy fretwork and a dependable, reliable feel straight out of the box that should cope admirably with whatever you throw at them, whether you are a young beginner or an experienced player of smaller stature. Indeed, the lower string tension of a 610mm scale length - which will be abundantly familiar to Jaguar players - combined with comfortable Modern C neck profile and 241mm (9.5-imch) fingerboard radius makes for a breezy, string bend-friendly playing experience, although the 'medium jumbo' frets are closer to medium-vintage as far as we're concerned. This instrument would be fun to have knocking around in the corner of a living room for players of a larger stature, too, and it's been a long time since we've played a solidbody Fender that's weighed 6.5lbs or less - it's a real pleasure. Plugged in, there's overall tonality that's on the darker end of the Strat spectrum, and thus better suited to Texas blues and late-60s flavours than it is crystalline 50s twang or Frusciante funk-rock. The Guild 'Anti-Hum' Dual-Coil doesn't perhaps feel as naturally at home here as it does in a Starfire semi, but the solidbody setting brings out a throaty, midrange-rich voice that will please those who find a vintage-style Strat single-coil sound too thin. Position two hollows things out a little and is a great sound for chiming clean experimentation, while positions three, four and five serve up usable SRV and Jimi-style tones, as any decent 60s-style, rosewood 'board Strat should. It's not the most knockout-sounding Strat in history, but given the compact platform and £300 street price, it would be churlish of us to complain.